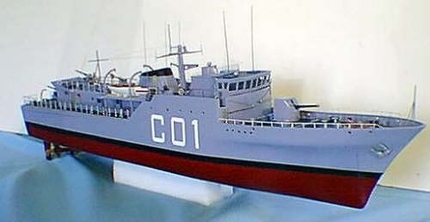 The startling contrast between this simple little ship and the four GM corvettes now being built in Italy (1980) vividly demonstrates the change of stance of the Libyan Navy in less than a decade. This ship is classed as a MK1 B and is a repeat of the 1A class of ships that were constructed for Ghana. The weapons fit are impressive for such a small craft, consisting of one DP 4” gun, four 40mm single bofors in powered mounting and 5 x 2” rocket flare launchers. Being the first ship of any size built for the Libyan navy, she was built to a very simple specification and also included in the design was state accommodation for her to serve as a presidential yacht. To this end she carries a crew 0f 5 officers and 58 men. The Tobruk is fitted with lower power engines than the latter i,e, two Paxman Ventura 16 YJCM diesels with an output of 3,800 HP on two shafts giving a top speed 18 knots. Her displacement is 500 tons full load with a draught of 13ft. As far as is known she still serves this function, and is still afloat and active. She was later refitted with two modern 40mm in single mountings with radar control.